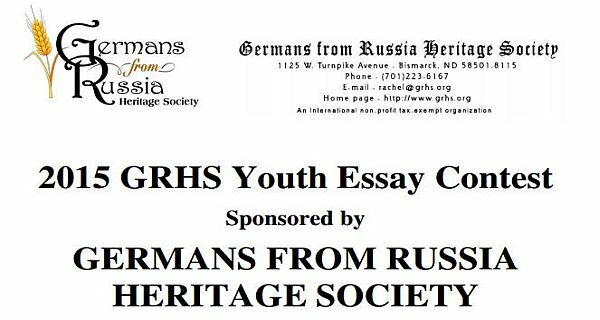 An International GRHS Essay Contest is sponsored by the Germans from Russia Heritage Society. The contest is intended to encourage students from around the world to learn about the history and culture of the German-Russians, people who emigrated from Germany into Russia during the 18th and 19th centuries. Winning contestants will be invited to receive their awards at a luncheon held in their honor during the GRHS Convention on 16-19 July 2015 at Bismarck, ND. Germans from Russia Heritage Society was founded on January 9, 1971 under the name North Dakota Historical Society of Germans from Russia (NDHSGR). Middle School…6th thru 8th grade. High School…9th thru 12th grade. University or College Undergraduate, limited to undergraduate students enrolled full-time in degree-seeking programs. Cultural Anthropology of the German-Russians. Historical analysis of the reasons for the Diaspora (scatter) of the German-Russians. German-Russian history in the Americas and Canada. German-Russian history in Russia, the Soviet Union, loss of Soviet citizenship, labor camps in the Soviet Union, and labor camps in England and France after World War II . Personal family history, insofar as it relates to German-Russian history and culture. Research papers, including persuasive works and/or historical analysis. Creative writing, including short stories, fictional diaries, plays, historical fiction, and descriptive prose. Creative writing endeavors should evidence an exploration and understanding of German Russian history and culture. Genealogical history of a particular family including individual histories of ancestors. Digital Media, including but not limited to PowerPoint, short film, and website design. Essays and entry forms may be sent by e-mail to: nd_roots-at-yahoo.com. Middle School: 1st place Trophy and $150, 2nd Place Runner-Up Trophy and $100. High School: 1st place Trophy and $150, 2nd Place Runner-Up Trophy and $100. High School Senior Scholarship: Trophy and a $300 Gwen Pritzkau scholarship will be awarded to the highest scoring high school senior entry. This scholarship is provided by the Heritage Foundation for Germans from Russia. University: Trophy and a $1000 scholarship will be awarded to the highest scoring university entry, 2nd place will receive a Runner-Up Trophy and $250. Completed essay and entry form must postmarked by March 31, 2017. The German-American Hall of Fame (GAMHOF) is pleased to announce the 2018 Student Scholarship Essay Contest. The mission of the German-American Hall of Fame is to highlight the contributions of outstanding Americans of German ancestry, underscoring the tremendous positive impact of America's largest immigrant group. Applicants are asked to write an essay, in 750 words or less, about the impact of an athlete of German descent in the United States. The athlete can be male or female, immigrant or not. But the athlete's primary impact should be in the United States. With separate competitions for college and high school students, the essay contest will offer cash awards totaling $3,500 for the winning students in 2018. The two first prize winners will each take home $1,000, with runners-up winning $500 each, and third place winners earning $250 prizes. Students who will have graduated high school prior to July 31, 2018 should enter the college competition. Student who have completed their Bachelor's/college degrees are not eligible for this competition. The GAMHOF Student Scholarship Essay Contest application can be found here. The deadline for applications is Monday, January 15, 2018.